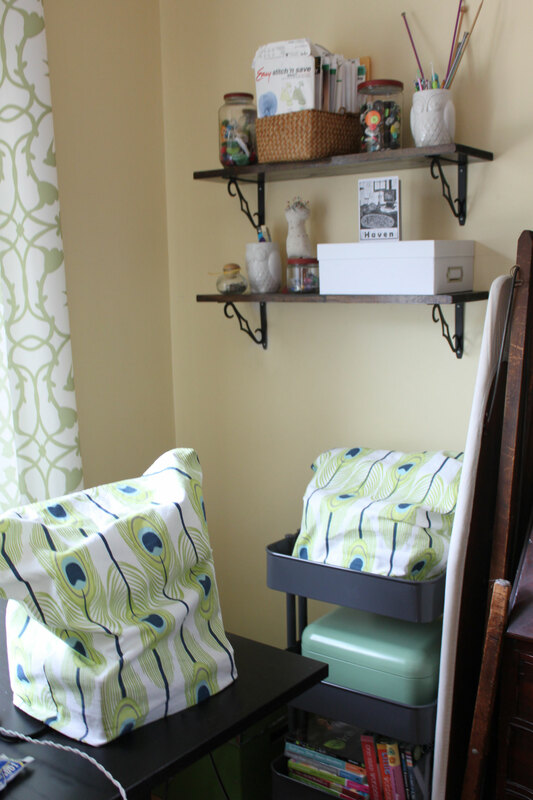 I made and hung brazen, bold and beautiful family room curtains about five years ago. You can see them in this photo from 2011. 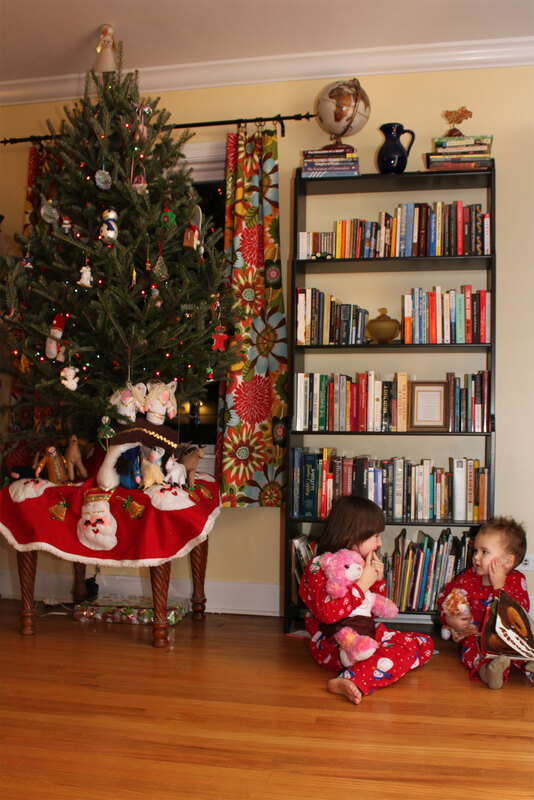 They were from Robert Allen’s Kiki Pinata fabric and they set the stage for my family room, which was bold and cozy at the same time. Here are some other pictures of the room as it was, in an old post. I loved it, but I was getting tired of it. For one thing, it’s just a really bold fabric, and one nice thing about homemade curtains is that it’s okay to change them in five years if you’re a little tired of the print. For another, I thought I would like the coziness that the bright yet dark colors would bring to the room, but instead it was starting to feel too dark. In the winters it gets dark so early; lighting a fire at 3:30 and settling into our family room was so great, but sometimes by 9:00 I just wanted a break. So this summer I gave my family room a lightening-up. I’m not posting pictures of the whole room yet because the final touch is going to be a makeover of our fireplace and that requires my brother’s DIY skills instead of mine, but here’s what I’ve got so far, before he comes and finishes the job for me. 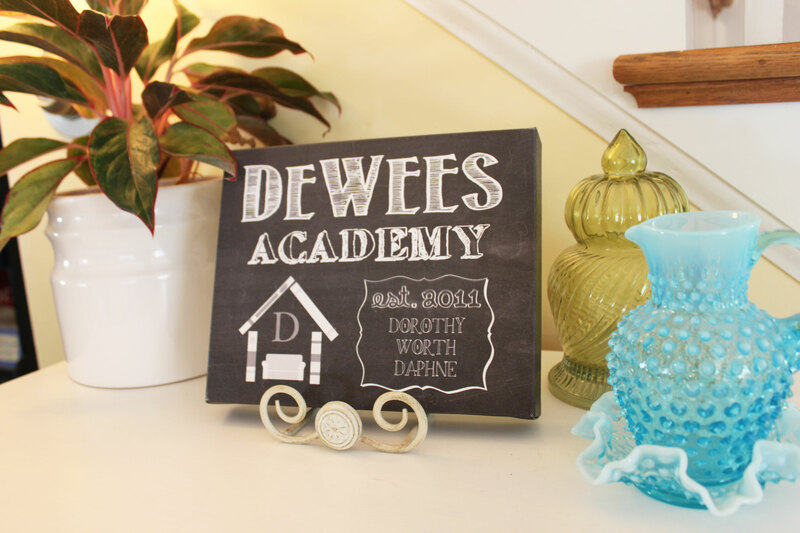 I made a sign for our homeschool, complete with our new logo (read more here). I designed the sign on the computer and had it printed on canvas. Then I picked out new, white things for my mantle. 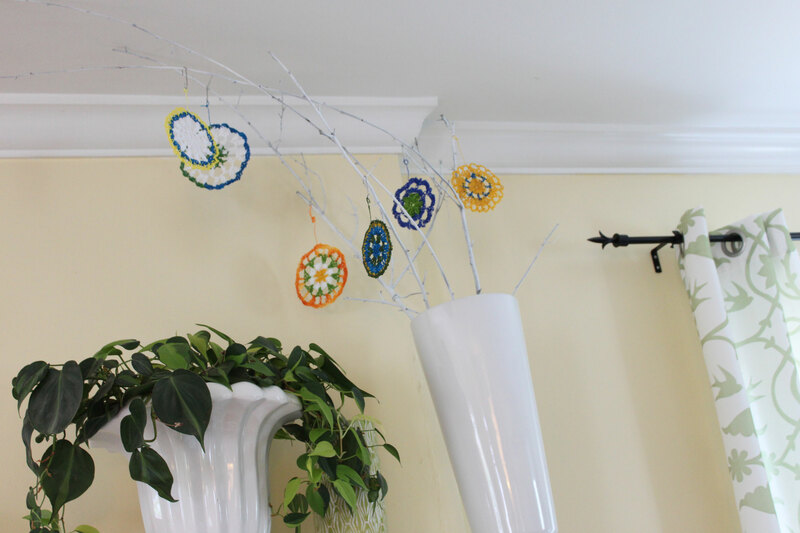 I spray-painted branches for a tall vase, then crocheted and stiffened medallions out of cotton thread to make colorful ornaments. Instead of making new curtains, I ended up buying some ready-made ones that were such a good deal they were cheaper than sewing new ones myself. The white lets in so much light, and really brightens up this room. My sewing area got a little lift too, with new dust covers for my machines and some new white storage containers for supplies. 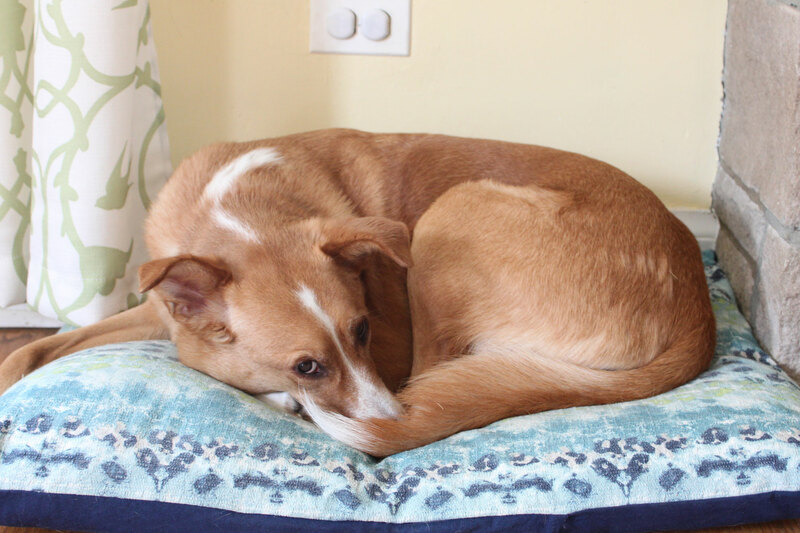 Of course Belle was not left out; her new bed fits the new scheme! 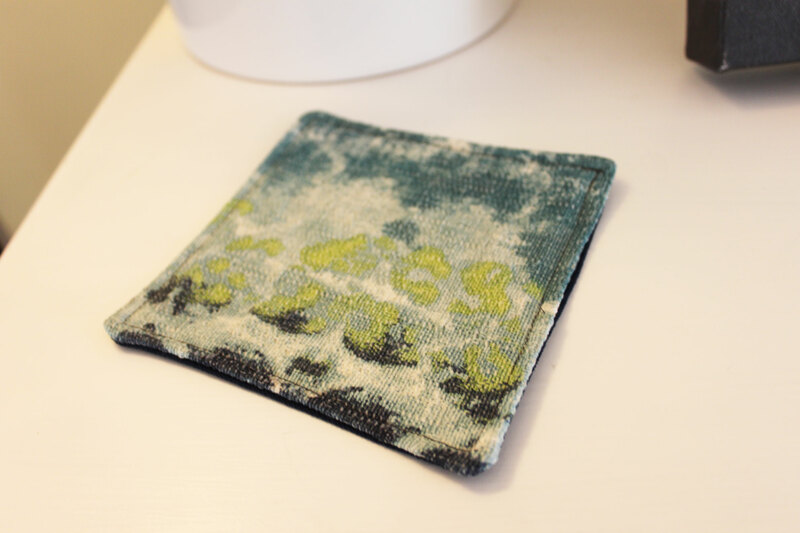 And new coasters from the dog bed scraps! 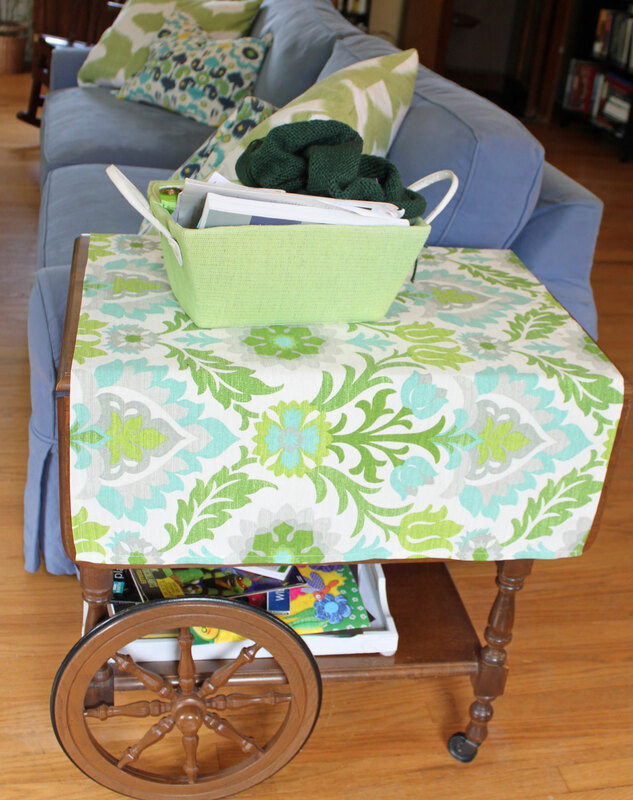 And I have been using a cart next to our sofa to coral some of the school things we need close at hand. I made it a tablecloth to keep it from getting beat up (it was my Grandma’s) while tying in all the green stuff I’ve added to the room. I’ve also painted some furniture and I’m gathering up the courage (and funds!) to buy a rug, but I’ll save all that for the post after the fireplace is done. I’m really enjoying the room’s new vibe. It’s still cozy and lively, but now the daylight seems to go much farther in here.